This section covers the theory and operation of "Maximum Power Point Tracking" as used in solar electric charge controllers. Check out our MPPT charge controllers. So what do you mean by "optimize"? Solar cells are neat things. Unfortunately, they are not very smart. Neither are batteries - in fact, batteries are downright stupid. Most PV panels are built to put out a nominal 12 volts. The catch is "nominal". In actual fact, almost all "12-volt" solar panels are designed to put out from 16 to 18 volts. The problem is that a nominal 12-volt battery is pretty close to an actual 12 volts - 10.5 to 12.7 volts, depending on state of charge. Under charge, most batteries want from around 13.2 to 14.4 volts to fully charge - quite a bit different than what most panels are designed to put out. OK, so now we have this neat 130-watt solar panel. Catch #1 is that it is rated at 130 watts at a particular voltage and current. The Kyocera KC-130 is rated at 7.39 amps at 17.6 volts. (7.39 amps times 17.6 volts = 130 watts). Where did my Watts go? So what happens when you hook up this 130-watt panel to your battery through a regular charge controller? Unfortunately, what happens is not 130 watts. Your panel puts out 7.4 amps. Your battery is setting at 12 volts under charge: 7.4 amps times 12 volts = 88.8 watts. You lost over 41 watts - but you paid for 130. That 41 watts are not going anywhere, it just is not being produced because there is a poor match between the panel and the battery. With a very low battery, say 10.5 volts, it's even worse - you could be losing as much as 35% (11 volts x 7.4 amps = 81.4 watts. You lost about 48 watts. One solution you might think of - why not just make panels so that they put out 14 volts or so to match the battery? Catch #22a is that the panel is rated at 130 watts at full sunlight at a particular temperature (STC - or standard test conditions). If the temperature of the solar panel is high, you don't get 17.4 volts. At the temperatures seen in many hot climate areas, you might get under 16 volts. If you started with a 15-volt panel (like some of the so-called "self-regulating" panels), you are in trouble, as you won't have enough voltage to put a charge into the battery. Solar panels have to have enough leeway built in to perform under the worst of conditions. The panel will just sit there looking dumb, and your batteries will get even stupider than usual. Nobody likes a stupid battery. What is Maximum Power Point Tracking? Panel tracking - this is where the panels are on a mount that follows the sun. The most common are the Zomeworks. These optimize output by following the sun across the sky for maximum sunlight. These typically give you about a 15% increase in winter and up to a 35% increase in summer. Maximum Power Point Tracking is electronic tracking - usually digital. The charge controller looks at the output of the panels and compares it to the battery voltage. It then figures out what is the best power that the panel can put out to charge the battery. It takes this and converts it to best voltage to get maximum AMPS into the battery. (Remember, it is Amps into the battery that counts). Most modern MPPT's are around 93-97% efficient in the conversion. You typically get a 20 to 45% power gain in winter and 10-15% in summer. Actual gain can vary widely depending weather, temperature, battery state of charge, and other factors. Grid tie systems are becoming more popular as the price of solar drops and electric rates go up. There are several brands of grid-tie only (that is, no battery) inverters available. All of these have built in MPPT. Efficiency is around 94% to 97% for the MPPT conversion on those. Here is where the optimization or maximum power point tracking comes in. Assume your battery is low, at 12 volts. An MPPT takes that 17.6 volts at 7.4 amps and converts it down so that what the battery gets is now 10.8 amps at 12 volts. Now you still have almost 130 watts, and everyone is happy. Ideally, for 100% power conversion you would get around 11.3 amps at 11.5 volts, but you have to feed the battery a higher voltage to force the amps in. And this is a simplified explanation - in actual fact, the output of the MPPT charge controller might vary continually to adjust for getting the maximum amps into the battery. On the left is a screenshot from the Maui Solar Software "PV-Design Pro" computer program (click on the picture for full-size image). 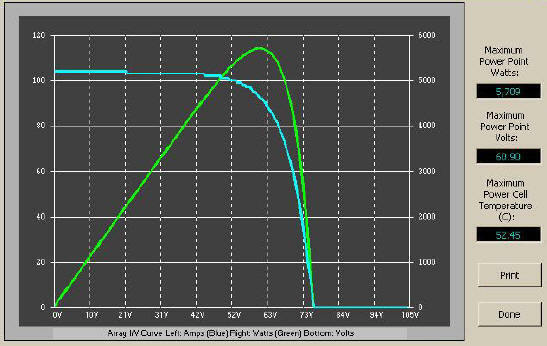 If you look at the green line, you will see that it has a sharp peak at the upper right - that represents the maximum power point. What an MPPT controller does is "look" for that exact point, then does the voltage/current conversion to change it to exactly what the battery needs. In real life, that peak moves around continuously with changes in light conditions and weather. An MPPT tracks the maximum power point, which is going to be different from the STC (Standard Test Conditions) rating under almost all situations. Under very cold conditions a 120-watt panel is actually capable of putting over 130+ watts because the power output goes up as panel temperature goes down - but if you don't have some way of tracking that power point, you are going to lose it. On the other hand under very hot conditions, the power drops - you lose power as the temperature goes up. That is why you get less gain in summer. Winter, and/or cloudy or hazy days - when the extra power is needed the most. Cold weather - solar panels work better at cold temperatures, but without an MPPT you are losing most of that. Cold weather is most likely in winter - the time when sun hours are low and you need the power to recharge batteries the most. Low battery charge - the lower the state of charge in your battery, the more current an MPPT puts into them - another time when the extra power is needed the most. You can have both of these conditions at the same time. Long wire runs - If you are charging a 12-volt battery, and your panels are 100 feet away, the voltage drop and power loss can be considerable unless you use very large wire. That can be very expensive. But if you have four 12 volt panels wired in series for 48 volts, the power loss is much less, and the controller will convert that high voltage to 12 volts at the battery. That also means that if you have a high voltage panel setup feeding the controller, you can use much smaller wire. Ok, so now back to the original question - What is an MPPT? The Power Point Tracker is a high-frequency DC to DC converter. They take the DC input from the solar panels, change it to high-frequency AC, and convert it back down to a different DC voltage and current to exactly match the panels to the batteries. MPPT's operate at very high audio frequencies, usually in the 20-80 kHz range. The advantage of high-frequency circuits is that they can be designed with very high-efficiency transformers and small components. The design of high-frequency circuits can be very tricky because of the problems with portions of the circuit "broadcasting" just like a radio transmitter causing radio and TV interference. Noise isolation and suppression becomes very important. There are a few non-digital (that is, linear) MPPT's charge controls around. These are much easier and cheaper to build and design than the digital ones. They do improve efficiency somewhat, but overall the efficiency can vary a lot - and we have seen a few lose their "tracking point" and actually get worse. That can happen occasionally if a cloud passed over the panel - the linear circuit searches for the next best point but then gets too far out on the deep end to find it again when the sun comes out. Thankfully, not many of these around anymore. The power point tracker (and all DC to DC converters) operates by taking the DC input current, changing it to AC, running through a transformer (usually a toroid, a doughnut looking transformer), and then rectifying it back to DC, followed by the output regulator. In most DC to DC converters, this is strictly an electronic process - no real smarts are involved except for some regulation of the output voltage. Charge controllers for solar panels need a lot more smarts as light and temperature conditions vary continuously all day long, and battery voltage changes. All recent models of digital MPPT controllers available are microprocessor controlled. They know when to adjust the output that it is being sent to the battery, and they actually shut down for a few microseconds and "look" at the solar panel and battery and make any needed adjustments. Although not really new (the Australian company AERL had some as early as 1985), it has been only recently that electronic microprocessors have become cheap enough to be cost-effective in smaller systems (less than 1 KW of the panel). MPPT charge controls are now manufactured by several companies, such as Outback Power, Xantrex XW-SCC, Blue Sky Energy, Apollo Solar, Midnite Solar, Morningstar and a few others.